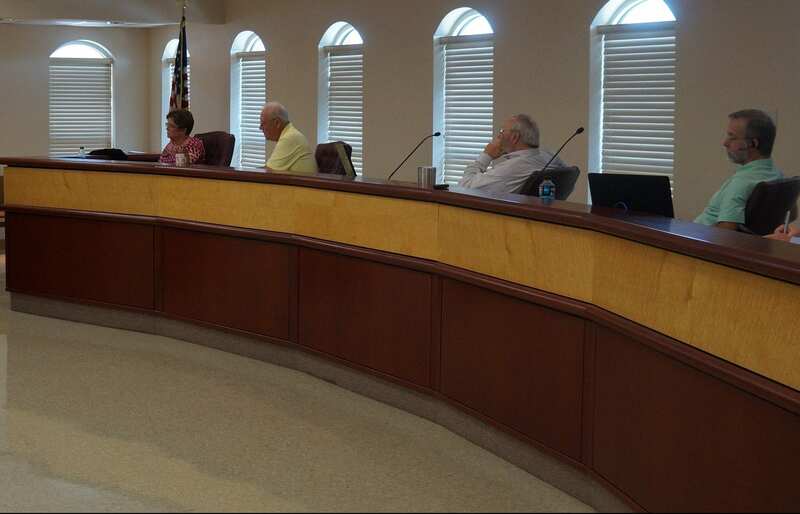 ELLIJAY, Ga. – The Gilmer County Board of Commissioners spent the majority of their January meetings discussing rezoning requests from citizens. Though three requests were on the agenda, the two that took the most attention involved a change from R-1 residential low density to A-1 agricultural for Russell Moss Jr. and Vicki Moss (Tax Map 3050K, Parcel 013) as well as an A-1 agricultural to A-1 agricultural with conditional use for Neil Gary (Tax Map 3083, Parcel 034C). The Moss request involved planning for three structures on the property as Vicki Moss originally stated she wanted to plan on having ultimately one house as well as two tree houses for rent but was not trying to build a trailer park or similar setup. Though she bought the property as R-1 and stating she initially had no thought to change it, Moss stated she had later learned the restrictions of structure numbers for R-1 zone when she thought about building the additional structures. Moss stated she only wanted to rezone to agricultural to put three structures on the one lot without paying an engineer to subdivide the lot and make room for the structures individually. A sentiment that Gilmer County Commission Chairman Charlie Paris had earlier, in the commissioners work session, opposed due to making an agricultural lot on a road among numerous other residential lots. Though she stated her intended use, Paris commented he did not want to “open up” the lot to potential uses approved under agricultural with a later owner or something of the sort. Citizens from the area spoke in opposition to the request as well. Property owner Bill Stucker echoed the chairman’s comments asking for the board to protect them as neighbors and the feel of their neighborhood as it is. Jason Hoffsteader, owner of 35 acres on Stillwell Road, noted the road’s current condition and narrowness. Noting Moss’ idea of renting properties, he said he was concerned with extra drivers who did not know the road coming through the neighborhood. The extra congestion of continuous “new-to-the-road” drivers could cause added stress of accidents due to the road’s condition. Hoffsteader also noted he chose his location when he bought the property due to large tracts with single houses in the neighborhood. A very unusual occurrence came as Stillwell resident Albert Goode came to the commissioner’s podium to speak. He asked Moss if he could question her in the meeting. As she agreed, Chairman Paris allowed the questioning in the meeting. However, after roughly five minutes of questioning, Paris stepped in to end the questioning. Though he noted he originally allowed the questioning because he wanted to hear the citizens speak, he directed public comments to return to being addressed to the commissioners. During the questioning, Goode questioned Moss’ intended uses for the properties she owned in the area. With three properties in total, the issue Goode questioned was having mobile tiny homes on the lots. Goode’s opposition was based on quality of life in the area with the extra buildings in use. Moss informed those present that while the one zone in question was requested for three rental properties, she would be ultimately building her retirement home on one of the other properties. The rental property she wanted to build would also access the creek for floating for anyone renting the property. Despite the denial, Moss can still return to her property and, having enough space in the lot, subdivide it into three lots to continue forward with her plans for rental property with tiny homes after the commissioners finish their moratorium on tiny homes on wheels. The second item of note, also denied, came from the rezone request for Neil Gary to add a conditional use on his agricultural zone property. The conditional use was to allow a gun range to be put on the property. The Planning Commission recommended denial of the request. In Gary’s application, he noted his “extensive and verifiable backgrounds in special operations, law enforcement and armed security.” Wanting to offer training and services to both law enforcement and civilian clients, Gary stated he wished to offer training in several areas in addition to “how to shoot” including how to carry safely, when not to take one’s gun out, and when not to shoot. Though denied for the rezone for conditional use, the commissioners noted this application for rezone was for a commercial setup and does not weigh on a person’s personal right to firearms practice and similar activities. There was also an approved request for Dogwood Financials, LTD, (Tax Map 3082, Parcel 072) to downgrade the plot from R-3 residential multi-family to R-2 high density. « Previous Article Cherry Log Fire Station: a promise fulfilled?